1. Could the Negotiation Lab design a training program that addresses this challenge for negotiation training in an on-going, cost effective and time efficient process? 2. Could the Negotiation Lab find a way to systematically identify who were the most effective negotiators in the company to (1) create added value in contracts; (2) act as mentors to junior staff; (3) to support the most strategically important negotiations? To meet these two challenges, The Negotiation Lab teamed up with iGBL Ltd. (Interactive Game Based Learning) based at the Launchpad of the Saïd Business School at Oxford University, and later with iDecisionGames, a New York-based company that grew out of the incubator program at MIT/Harvard, to design & develop a new negotiation assessment system using an on-line platform based on the Thomas-Kilmann Conflict Mode Instrument (TKI), that measures how effectively a negotiator uses the five core tendencies (compete, collaborate, compromise, accommodate and avoid) as well as measuring their ability to be assertive and empathetic. The platform is also able to capture the pre-negotiation strategy of the participant, which is how they perceived the possible outcome before they got to the negotiation table, as well as their post-negotiation evaluation of both their own performance and that of their opponent in rating the effectiveness of each party’s use of the TKI tendencies towards dealing with conflict. In addition to the quantifiable data the system collects, the on-line simulations are conducted in video-chat mode and they can either be observed in real time by the trainer, or at a later date, as they are permanently stored on the system. The video of the negotiation is done by split screen, so that the two negotiators can see each other and the trainer who can observe them in real time. After the simulation is completed, all three participate in a 30-minute debrieifing for a quality assessment where they are given personal coaching tips to improve their effectiveness. These videos can also be played back by the participants at a later date for them to study at their convenience and to compare with their other performances. Finally, in order to build a cache of institutional memory, the Negotiation Lab can edit parts of the group's best and worst performances into a master tape for a future teaching resource in a Master Class. These quantifiable measures are then combined with the qualitative assessment of the instructor of the workshop to form an individual negotiator's profile, which at the end of the program is given to the managers of the organization's training team for evaluative purposes. Over the past 32 months, the Negotiation Lab has run 8 different Harvard Law School two-party online simulations a total of 204 times invloving 116 players (directors, group managers, area sales representatives and service engineers) based in 22 countries on five continents simultaneously. In the evaluation model, the Negotiation Lab created an optimal target range for an effective negotiator based on the outcomes from (1) A universe of 4,400 of senior executives and managers in the United States who took the TKI questionnaire in 2007. This data was published by CCP Inc. in California who owns the trademark of TKI. (2) The evaluation of outcomes of over 1,426 people from 135 countries who have taken the TKI questionnaire in 147 workshops given by the Negotiation Lab from 2008-2017. The scores and the corresponding percentile ranges of the five human tendencies used by all negotiators in their bargaining process to create the optimal target range created by the Negotiation Lab are: collaborating (score of 8 places them in the 74% percentile range); competing (score of 6 places them in the 69% percentile range); compromising (score of 8 places them in 58% percentile range); accommodating (score of 4 places them in the 30% percentile range) and avoiding (score of 4 places them in the 22% percentile range). In this model, being in the optimal target zone for collaborating, compromising and competing are strong indicators of using those tendencies to create added value in negotiations from what is initially presented at the bargaining table. We place less value in the tendencies to accommodate and avoid, as while they may be useful at times as tactical options (thus important to keep in the negotiator’s toolbox) in general, they do not lead to value creation. Another way of looking at creating added value is through the phrase: “looking for common ground while at the same time standing your own ground”. For a negotiator, it is equally important to be confident and willing to advocate for your principles, interests (and in a commercial sense the value of your product or service) thus showing your competitive tendency as it is to compromise (for short-term gains) and eventually collaborate (for long-term gains) in order to secure the relationship with the other party. To further compliment our understanding of how effective a negotiator is, the platform measures how assertive and empathetic (score of 6 in both categories places them in the 70% percentile range) the participant is during a negotiation. In all cases, we measure how a participant views themselves and how they view their opponent in these seven categories. We also compare these individual scores to the median scores of the group as a whole. Before each simulation, the participant is required to answer the following seven questions before the system will allow them to progress to the actual negotiation session. The answers provided an insight into how carefully the participant read and understood text of their confidential role-play script and prepared a strategy for the negotiation in advance of going to the bargaining table. Once written, the answers cannot be changed. 1. What is your Best Alternative to a Negotiated Agreement (BATNA)? 2. What do you estimate is the Zone of Possible Agreement (ZOPA) in this negotiation? 3. What do you estimate is the BATNA of the other party? 4. What are your interests and needs for the negotiation? 5. What are the interests and needs of the other party? 6. Do you plan to use any ‘objective standards’ in the negotiation? If so, what are they? 7. What ‘objective standards’ do you anticipate the other party using? Following the negotiation, the two sides need to agree to the wording of the final agreement. They must also disclose who made the first offer in the negotiation and for what amount. This is then compared to final amount agreed to, and over the course of four simulations, we can then tell who has a tendency to anchor first and whether they started out to high and ended up bidding against themselves, or they started low and were able to gain concessions from the other side. Most importantly, the post-negotiation answers are both qualitative and quantitative, and when shared in the debrief between the parties offers valuable insight and constructive criticism on how to inprove. 8. What, specifically, did your counterpart say or do during the negotiation that went well? 9. What, specifically, could your counterpart improve in a future negotiation? 10. I am satisfied with my own outcome, i.e., the extent to which the terms of my agreement (or lack of agreement) benefit me. 11. I am satisfied with the balance between my own outcome and my counterpart's outcome. 12. I feel like I forfeited or "lost" in this negotiation. 13. The terms of my agreement are consistent with principles of legitimacy or objective criteria (e.g., common standards of fairness, precedent, industry practice, legality, etc.). 14. I "lost face" (i.e., damaged my sense of pride) in the negotiation. 15. This negotiation made me feel competent as a negotiator. 16. I behaved according to my own principles and values. 17. This negotiation positively influenced my self-image or my impression of myself. 18. My counterpart listened to my concerns. 19. The negotiation process was fair. 20. My counterpart considered my wishes, opinions, or needs. 21. I am satisfied with my relationship with my counterpart as a result of this negotiation. 22. The negotiation made me trust my counterpart. 23. The negotiation built a good foundation for a future relationship with my counterpart. 24. How assertive were you? 25. How empathetic were you? 26. How competitive were you? 27. How accommodating were you? 28. How collaborative were you? 29. I tended to avoid answering my opponent’s questions or consider my opponent’s proposed options. 30. I favored compromising as a way to resolve our differences. 31. How assertive was your opponent? 32. How empathetic was your opponent? 33. How competitive was your opponent? 34. How accommodating was your opponent? 35. How collaborative was your opponent? 36. My opponent tended to avoid answering my questions or consider my proposed options. 37. My opponent favored compromising as a way to resolve our differences. 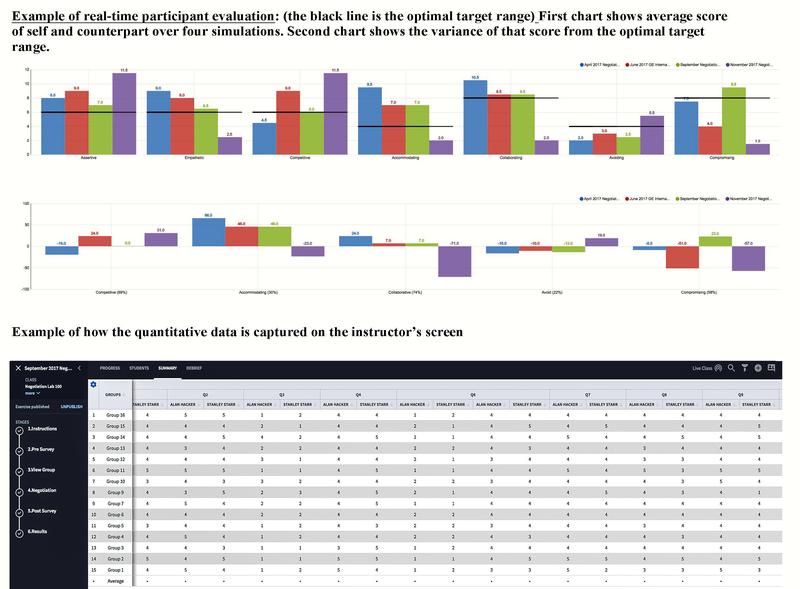 Examples of how the instructor can track the participants working their way through the stages of the simulation process and then see which teams arrived at similar outcomes.